When I lived in Germany, I shopped a lot at the German Amazon.de store. And still make the occational purchases from abroad of products I cannot find anywhere else. Struggling with the language, I found out you can use the whole site in English. 2018: Now English version available! New! Also Polish, Dutch & Turkish languages are now available. Please note! Translation not perfect, see below for further instructions..
Germany has changed over the years, to a nation that’s highly proficient in the English language. The German Amazon store however, has been slower in this part of the development. Even though the population consists of 9% foreigners. Do you know what “Ein gutschein für alle fälle” means? No problem, me neither even though I shop there. Amazon is hugely popular in Germany. And because of the “Sell on Amazon” service where anyone can put up shop, there are many products that simply cannot be found from anywhere else. With inexpensive international shipping and an efficient, trusted service as well as a good enough review system. I’ve had loads of good reasons to turn to Amazon.de for my shopping needs. Both inside and outside of the country. The only restriction is the language, as anyone in the world can shop there. Which turns out is not a problem! German belongs to the same group of languages as English, known as Germanic languages. Making it easy to translate, and I don’t mean the manual way. There are plenty of automated ways to achieve this. If you are looking to buy English language books or even a dictionary, see this link which takes you directly to the right section of the store. Follow this simple trick.. ! Basically, we just need a browser that can translate any page automatically while you are browsing the store. Probably the easiest and my favorite method is to use Google Chrome. Which has this feature built in and it should ask you “would you like to translate this page?” automatically after you enter www.amazon.de in your address bar. Also the same is possible with the Mozilla Firefox browser. Download an extension called “S3.Google Translator“. A press of a “Add to Firefox” button and a browser re-start is all it requires. The add-on will create a little icon on the top right corner of your browser. Where you can select “Automatically translate www.amazon.de“. Turning off “Translation of selected text on the fly” might be a good idea if you don’t need it. There are plenty of other neat features too, but it already functions well as it is in my opinion. It will ask you some questions, to which you need to answer “OK”. Always automatically translate www.amazon.de ? 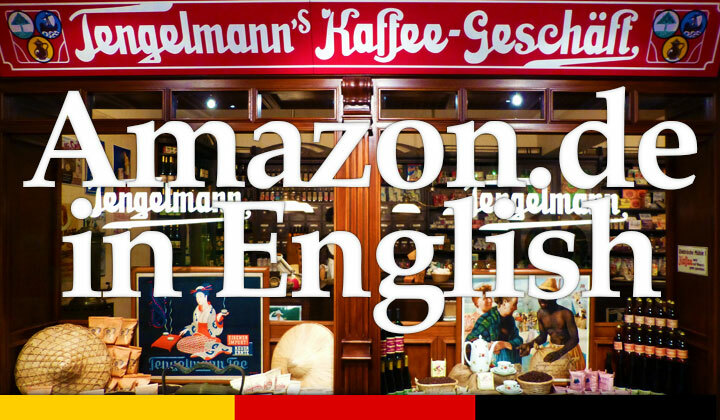 And you have a fully functional German Amazon store in English! If you want to use some other browser like Internet Explorer, Opera, etc. there might be similar options as well. Just make sure that it’s automatic that you don’t need to choose to translate every page manually as is the case with all the other Firefox extensions. If you know of other ways to easily translate the site, please let us know in the comments! And note that Amazon.de has helpful English speaking staff that can answer any questions about shopping there. Enjoy. Very useful guide, I could do my shopping without problems. Very glad to hear that. Thanks for your comment. You can use the following link to open secure private connection with amazon.de and for example with Google Chrome, you can check the validity of the website, verified with a highly trusted certificate authority. Just click on the green “lock icon” in the address bar. Other browsers have a similar function. This means you are shopping securely with the official Amazon company. And they take security very seriously. If any other questions, please let me know! My name is Gustavo Mendoza. I live in Reus, Spain, and I would like yo buy an inflatable boat with sails. Could you send me some information about these boats? Hi Gustavo. For inflatable sailboat/dinghy with sails you might want to look at what eBay has to offer instead. For example the sailboats To Go seller has several sail kits to conver your boat to a sailboat. Or you may look at ready inflatable sailboats for sale. All the sellers will have worldwide delivery. PS. I edited the email address in your comment to prevent spam. Amazon.de in english is the best idea!!! Perfect! Can’t wait to install it now…. Hi! If you are located in Austria, I would take my business to the Austrian Universal online warehouse. They are well established in the country, and sell anything from clothing to appliances, etc. I’m sure you’ll find plenty of shirts from there. Here’s wishing you a wonderful year ahead!! Thanks same to you! 🙂 I cannot speak from personal experience but have you tried zalando.at, selling all sorts of fashion items, from shoes to clothing. They operate in fourteen countries, including Austria. Good But you cannot use the Amazon Store Card from the States, I’m having a nightmare now. Sorry to hear about your troubles. Yes, the store cards are not compatible with each other. Shopping there is certainly not always a smooth experience. :/ Do let me know if there is anything I can help with. Thanks. Can you turn amazon.de on the iOS app into English also? Good question. I’m afraid that this is not possible. Unless they choose to update this feature into the app in the future. I am going to go ahead and suggest it to them. Came upon this when I was trying to figure out how to order something for a friend who lives in Germany. I took your good advice and used Amazon. However, what is not yet common knowledge is that Amazon is testing an English version of their German site which is great. Just Google ‘Amazon.de in English’ and you can find the link. You do still need the Google translator for the confirmation e-mails etc. but it makes searching for products very much easier. Thanks for the feedback Ann. I have changed the link on the top of this page to easily find this new version of the website. Seems to be working well. Hi this is najib hamoon I bought a mobile phone zada z1 I received 2 days ago so I wana change it to another mobile how I can do it thanks. I’m in lutjenburg city Germany ….. Please navigate to the “Rücksendezentrum” (Returns Support Centre) on Amazon.de and follow the instructions there. You can find it by going to the “Hilfe” (Help) section and in the bottom of that page find “Brauchen Sie weitere Hilfe?” and under that, click on the link that says “Artikel zurücksenden oder ersetzen“. There are also instructions in English on how to use the Returns Support Center. Hi. German subtitles would most likely be an optional feature. Especially on newer releases. Although they might be turned on by default. But simple to turn off. Can I internationally ship Amazon.de product directly to Hong Kong ? If the seller or the specific product supports international shipping, yes. A lot of electronics that contain a battery cannot be usually shipped. Check the part where it says “This item can be delivered to..” below the product for more details. I’m from the USA and want to have a DVD boxed set shipped to me in the states. Is this possible? When I was filling out the address form the United States wasn’t an option. If the DVDs are sold by Amazon, international shipping is most likely available. You can go directly to the product page and check the “This item can be delivered to..” bit. You can also add your address to your account first and then try to check out. I have a question:as a payment option,is virtual Master Card accepted on Amazon.de?Your advice will be much appreciated,thank you. Thanks for asking. I’ve often used a “virtual” Prepaid Visa Card myself without problems. So I would assume that MasterCard is accepted as well. I wish to have my Kindle info. and book selections in English, not in German. Please help. Hello. You can find the instructions to change Kindle language in English here, — compare with the German version of the same instruction if you need assistance with terminology here. Does that help? I’d like a reply to my problem, please. If the instructions don’t work for you, let me know what is the problem and I’ll try to assist further 🙂 Thanks. Hi: We ordered to items from you a little over two weeks ago, but the items were not sent to the address in Berlin because you needed some credit card information from us. We tried to fax the information to you, but that did not work. We tried to email the information to you but that failed as well. Our friends are only in Berlin until August 17, and we’d really like to get the gifts to them. Can you help us? I edited out the address in your comment to protect your privacy. As for your request, your only hope will be to be in direct contact with the support team in Germany. DAVID!!!!! I am not very computer smart. What I have is partly in English, but I need more of the German description of the articles I am looking at translated into English. Is there a way to have more of the german translated into English? I hope so and that you can explain to me how to get the German translated into English. Your assistance (ASAP, of course) would be much appreciated, David. I have a time limit to get a gift to someone in Germany. I thank you in advance for your assistance. I’m guessing you had already changed the language through the “globe icon”, from the blue section on top of all pages: DE to EN. That setting is important to have enabled and then to translate the rest of the text that’s still in German, the way easiest is to just use the Google Chrome web browser. Once you open up Amazon.de, it will suggest to do a live translation as you browse through the pages. I received a temporary password from you, and when I tried to use it, the sign in form said it was not a good one, so I stopped and now need some help to straighten out my account. I tried several times 2 weeks ago to order hearing aid battreries, Power One 312’s. You refused to use my mailing address, or the address where I live, which is different. I am USAF Retired and use a U.S. APO address for most mail, but in Germany, use my German address, both of which are in my account files…. Once we can straighten out my account problems, this translation to english will open a new door for me. Thank you so very much…..
Looks like their business address is located in New York, US — but this is not necessarily where to product is being sent from. To find out more, please check the “track package” section of the ‘shipment details‘ page of your order. After the item is in transit to carrier and arrived to the shipment facility, it will display a more detailed location of where it’s being sent from. Hope this helps, and thanks for asking! Most glad could help, appreciate your feedback thanks! What do you order from Germany that you like ? Ich brauche dringend eine Adresse von Amazon um 2Artikel zurückzusenden. I have no updates on my Order # 304-8539193-7874731 effected on 11th December 2017 and paid on 13th December 2017. Can you please let me have tracking details?